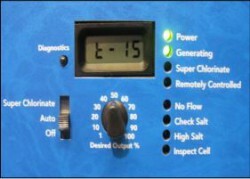 Hayward’s AquaRite Salt Chlorine Generator is one of the most popular lines on the market today. It is one of the easiest ways for you to sanitize your pool. Although I won’t get into too many details on how great the product is, you can read our customer reviews to get unfiltered opinions about it. Still, one thing I do commend Hayward for is their simplistic error code guide. Compared to a lot of others on the market, going through their manual and troubleshooting guide was as customer friendly as you are going to get. But what good is a manual if customers don’t keep it? The Hayward AquaRite system was strategic in the design in the sense that there aren’t too many variations of error codes programmed into their system. Unlike the Jandy AquaPure unit, which displays a number that then corresponds to a particular error, the Hayward Aqua Rite is simplistic in nature. It tells you the source of the issue. If you take a look at the picture on the left, there are only 4 different error functions: No Flow, Check Salt, High Salt, and Inspect Cell. Although there may be several reasons for the error code to appear, having only 4 possibilities is great odds for a pool owner. It also makes it very clear to the pool owner what the issue might be once they venture out to the system. Let’s explore the different Hayward Aqua Rite error codes, what they mean, and how you can get rid of them. Seeing as this is a salt chlorine generator, one of the most frequent error codes you will see will have to do with your salt levels or the cell where the salt is produced. And because one directly affects the other, both lights will appear when there is an error concerning the salt levels. Let’s dig a little deeper. When both these lights flash together, it means your salt level is between 2500 ppm and2600 ppm. At this moment chlorine is still being produced, however your salt levels are dwindling. Keep in mind, your ideal salt level should read 3200 ppm. Your AquaRite system may be working efficiently and your pool may be clear at the moment, but in a week or so, it may not be the case anymore. Independently verify the salt levels in your swimming pool. You can utilize one of our at home testing kits, or you can get your water tested at your local pool store. Once your water has been tested, add salt to your pool to bring your levels back to the recommended 3200 ppm. You can review how to add salt on our site, as well. Inspect and clean cell if, necessary. If both the Check Salt and the Inspect Cell light stays on that means no chlorine is being produced at this time. That is a big “uh-oh” for any pool owner. It also means your salt level fell below 2300 ppm. Yikes! Both lights will also stay on if the control is set to the wrong turbo cell type, or if the cell is unplugged. Once your water has been tested, add salt to your pool to bring your levels back to the recommended 3200 ppm. 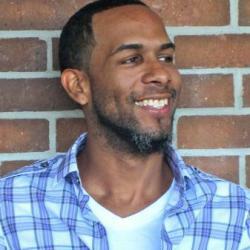 You can review how to add salt on our site. If your independent testing shows your salt levels are correct, but your system is showing something different, you may need to recalibrate your Aqua Rite unit. Inspect and clean cell, if necessary. Verify if the control is set to the correct turbo cell. If the ‘Inspect Cell’ light flashes by itself, it is an early indication that the cell life is coming to an end. Each cell is equipped with 500 operational hours and requires a manual reset once it expires. To reset the cell, hold down the ‘Diagnostic’ button for 3-5 seconds. The ‘High Salt’ light is exactly what it says There is literally a higher recommended amount of salt in your pool. Your unit will detect and alert this to the owner. The ‘High Salt’ light will stay on for several reasons including: cell amperage is above the maximum limit, the control is set to the wrong turbo cell, or you simply have too much salt in your pool. 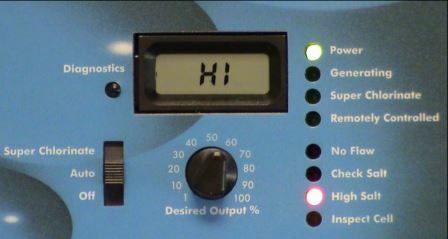 The LCD display will read “HI”. Once your water has been tested and the reading is too high, reduce the levels of salt in your pool to bring your levels back to the recommended 3200 ppm. Verify cell amperage to ensure it is not above the maximum limit for your model. Check below for the maximum current amps before the unit shuts down. The ‘No Flow’ light is an indication that there is something funny going on with the flow in your piping or the flow switch itself. If there is an issue with the flow, the ‘No Flow’ light will flash up to 60 seconds at start up. If none of the below remedies solves your issue, you may need to replace your flow switch. If a LED is flashing, wait 60 seconds after starting the filter pump. 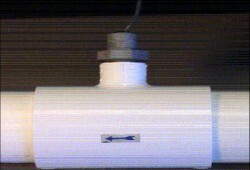 Check for possible disruption inside of the flow T. Installation requires 12 inches of straight pipe before the flow switch. There should be no elbow after the flow switch. If a LED is ON, check to see if the flow switch was installed correctly. The arrows at the top of the hex nut should point in the direction of the water flow. (Your flow switch requires a minimum flow rate of 11 GPMs to stay consistently closed. Check the flow switch for damaged or cut wires. Although there isn’t an error setting for temperature on the control, the LCD monitor will let you know if your water is either too hot or too cold for standard operation. The cell’s operating temperature range for the cell is 50F to 140F. The output is scaled back to 20% at 60F and output completely stops at 50F. The LCD display will read COLD when the water temperature is below 50F. The LCD display will read HOT when the water temperature is above 140F. No manual is more efficient than the technical support provided by the manufacturer. The manual allows you to get familiar with your system and put your DIY skills to the test. If at any point you do not feel comfortable or simply just don’t know what to do, definitely give us a call. If it’s something that we can’t solve, we will put you in contact with a rep from Hayward. Feel free to check out our how- to guide section for many more how-to guides dealing with the Hayward Aqua Rite system. I cleaned my salt cell. After reconnecting, I have no led lights. The read out works and the red no flow led is on when pump is off. I turn on pump all led lights are out. I checked the salt cell at the pool store and it’s fine. Is there a reset or what am I missing? can the resistor be replaced or is the mother board toast? I looked through a few AquaRite manuals but I do not see a P69 error code listed. Can you confirm you have a Hayward AquaRite? hi my also says only 69. cant find codes chart anywhere. the green led comes on for 5 seconds and then it turns off so are the other led. the only thing on is the salt reading at 3000.
water temp is at 64. The P 69 is the % setting that you have on your dial. For instance if you have your dial at 75 that will read P75. My generator is reading “cold” but the temperature reads 64. Why would this be happening and how can we fix it please?? 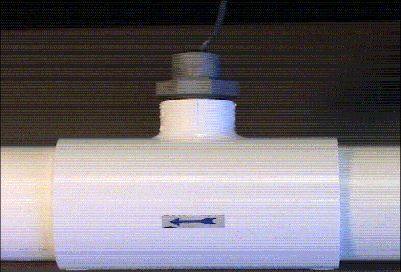 The water temperature sensor is located in the cell. It may be dirty, try cleaning the cell with an acid soak. Hopefully, that knocks loose whatever is in there. I did have my pool on a timer but in the last 2 weeks temps haven’t been above freezing so I turned pump on 24/7 to keep lines from bursting. My salt system says COLD. What do I need to do? Turn it off or leave it alone? There is nothing you need to do, other than waiting for the weather to warm up. Hi I have a Hayward Aquarite Salt Chlorine Generator that no long displays the temperature, salt reading or chlorine reading and the figures it does display don’t look accurate. It has also given me an -Er 3 code. Can you give any insight on what we can do to fix this. It does not seem to be generating any chlorine since this has started. For lack of a better term, your generator sounds really messed up. It sounds like a mix of three things, a bad display board, main PCB, and a dead cell. You can either contact Hayward directly for a troubleshoot or you can follow the steps in this Aquarite Troubleshooting guide. Forewarning, this guide is pretty technical so it may be a little overwhelming. the red light is on. i bought a new cell and its still on. do i need to re calibrate the board when i add a new cell? There are a few red lights on the control unit. Which one is lit on your control? The No Flow LED flashes for up to 60 seconds during startup. 1) If the No Flow LED is flashing, wait 60 seconds after starting your pump and filter. 2) Check for possible turbulence or obstructions inside of the flow T.
4) Ensure there are at least 12 inches of straight pipe before the flow switch. 5) There should be NO elbow after the flow switch. Have you had your water tested? if so, please post the results. That is going to help me to determine what steps we need to take in the chemical department. The temp sensor is located in the cell. If the new cell is giving that reading, there may be a bad connection between the cell and the control panel. Make sure the cell is plugged in all the way. I just ran through the display readings and #3, the Cell Amperage shows a Zero. The Quick Reference guide suggests my t-3 should be between 1.3 and 4.5 amps. What is a chlorination cycle? 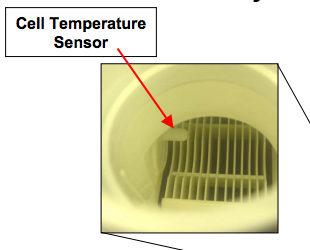 The temp sensor is built into the cell. Usually, a COLD reading and a blinking light are a sign the temp sensor is shot, requiring to replace the whole cell. You can try cleaning the cell, maybe used a toothbrush to clean off the temp sensor probe in the cell. You should only see the COLD reading when your water dips below the 50 degree F mark. I have the same problem but “HOT” I have already cleaned out the cell and still getting the same reading. Were is the temperature sensor? Like I said in the first reply it is built into the cell. There is a small white nodule on one side of the blades. Remote for what product? The Aqua Rite does not have a remote. Board. The salt level reads 2200 and below (drops a little everyday) but when I take it to the Pool store my Actual salt reading is 4000. I have cleaned the cell and reset it and it continues to happen. How old is your cell? You may be dealing with a spent cell. So the display says Cold! So what do you do? It doesn’t say what to do or you just don’t do anything?? With it currently being winter you’ll just have to wait a few months for it to warm up or use your pool heater to up the temp. Since it is so cold, your pool’s chlorine need is severely lowered, and algae can’t grow in temps below 50 degrees Fahrenheit. But if you want to play it on the safe side, get a chlorine float to supplement the chlorine. If your water is not at that temperature cold range then you may need to clean your cell. Replaced t15 cell cause GENERATING LIGHT was off. Brand new cell generating light still wont turn on only power all the reading work except the t cell # one. Were you unable to select “T15” on the display when you installed the new cell? What is the temperature where you live? Also, have you had your salt level tested yet? Salt generators do not work in temps 65-degrees or colder. But usually there is a “COLD” error code that pops up. High or low salt levels could be the problem, but the display lights should illuminate. The display board may be shot. Is the cell not producing any chlorine? Cannot get the ‘inspect cell’ light to go off…steady on, not blinking. I have cleaned the cell multiple times with the mixture of Mauriac acid ( 10 mins, then 20 mins, then 10 again) flushed with clean water, unplugged the cell, checked to ensure the control was still set for the t15. Nothing is working. This is an entire new system – 7 months old….. The AquaRite is programmed to display the “inspect cell” after 500 hours of cell use. This ensures a regular inspection/cleaning takes place. To reset the check cell light, you will need to hold the Diagnostic button for 3-seconds, then release. If the check cell light comes back, then you may have a faulty cell. Since the cell is only 7-months old it should definitely be covered under warranty, and replaceable. Thanks Matthew! Now….without any other ‘cleaning”, the “inspect” cell was flashing and I can reset it, but it would only stay off a couple of hours. This morning the reading is 2900 (preparing for warm weather and just added more salt Sunday) – the light is no longer ‘on’ nor ‘flashing’. It does worry me that there is still something wrong. I do have a local pool supply retailer who has suggested I bring in the cell to test, so I guess I will before the warranty expires – just in case. Thanks for the quick response! Hello. I changed the cell from t-3 to a t-9 since the system was not generating chroline. I confirmed it reads t-9 in the panel. Now it reads 4000ppm of salt and is not indicating high salt. I have tried to calibrate it several times but getting the same output. I had test the water and no chroline is detected. It’s the cell or the main pcb? 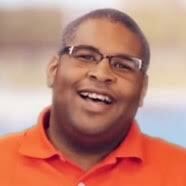 Have you had your water tested by a local pool store? If so, please post the results including CYA levels. The steps for troubleshooting issues like this hinge on an accurate salinity level. Hello, I get ”Cold” on display but no led light (even pump stop still no led light). I cleaned the cell temp sensor still the same. Pool temp is at 64 F. My cell is about 8 years old, is cell the end of life? 8 years is definitely at the high end of the lifespan of a salt cell. Those cells normally last 3-5 years. It sounds time for a new cell, let your old one go to that great big pool in the sky. We had a new salt cell system put in in October. It kept saying inspect cell and check salt and they replaced it. We opened our pool and it says the same thing. When I try to calibrate it starts at 2600 and goes down. The salt level is 3200. There is no way the cell needs cleaned because it was only used for 2 weeks before we closed the pool. Is it possible to have a second defective cell? I have a new t-15 salt cell, and a new circuit board. Display is ON, generating is ON, display says 3200 for salt level. But, during the day, and when the pump shuts down at the end of the day, the CHECK SALT light comes on, and the INSPECT CELL light comes on, The display says “SLo.” The green button next to GENERATING is still on. What does SLo mean? Salt low? (it is not). When the pool pump comes on the next morning, andn during the day, the system will continue to display these readings until I turn the system off, then back on. That clears the check salt and check cell light. Green GENERATING light stays on, and obviously green POWER light is on. The pool technician that came out this AM thinks its the water…he thinks there is too much salt. But I had it tested a couple of times, and it came out 3200. Any words of wisdom? The reported error would be very dependent on the control that is powering the T-Cell. The error displayed “SLo” is not programmed into an AquaRite, AquaTrol, or AquaRite Pro. I have encountered control boxes that were AquaRites which had a knock-off replacement board displaying some unusual codes. We had a new salt unit installed last summer. We just opened our pool and the no flow alarm is on, and nothing we have tried has gotten it to turn off. What could be causing the no flow alarm? Have you checked the filter’s pressure to make sure there isn’t an issue with the pump/filter system instead of the flow sensor? I have a new T-15 Salt Generator . I know it has well over 500 hours on it . Have not seen the light come up to inspect cell .Hayward Goldline AQR15 AquaRite Electronic Salt Chlorination System for In-Ground Pools , 40,000-Gallon Cell . What do you suggest ? If the cell is still producing chlorine, I wouldn’t worry about it. if it is a new cell, it would have to be run really hard right out of the gates for it to reach 500 hours already. The 500 hours is hours producing chlorine, not installed on the pool. So if you have your system set for 50% production and you run your pump for 8 hours a day; your cell would only have 4 hours of service on the counter for that24-hour period. Have you had your water tested to get the accurate salt level? This would explain if the cell is the issue or if you just need to add the salt. How to read the year was made on the cell? How we know how old is it? Contact the manufacturer Hayward with the serial number of the cell. They should be able to decipher the serial number for a date of manufacture. What is this mean and how do I get it back to correctly display my salt ppm? Hi my Aquatrol check cell and salt remain on. I have a reading of zero for both salt readings (average and instant) and my amp reads zero. Salt in pool is actually at 3200ppm (tested) cell is spotless (just cleaned). Completed all recalabrations (nothing changes). Pump is on, pool is balanced. System is over three years old. Please help. My Salt system is a Hayward Goldline Aquatrol T-5. The system is not producing any chlorine and I completed every trouble shoot I can find. Thank you for your attention. The AquaTrol has a different control than the Aquarite so the troubleshooting may not carry directly over. My experience with the AquaRite tells me that the two issues you are having point to two causes. The constant low salt is a salt cell problem, and the 0 amps reading is generally the main PCB. But my experience is mainly with Aquarite, the symptoms and causes may vary. So we have been adding a lot of salt to our pool because of the low salt readings thinking it was due to weeks of rain. We finally got the readings up to 2700 and then dropped within a few days thinking it was due to having to add water daily because of a leak in our liner. We got it back up to 2500 today and within an hour it dropped to 1400 and now shows 0. Would this be a bad cell (T15) a bad panel board. Could be a bad board or a cell. Have you tried cleaning the cell? Or, have you tried any other troubleshooting besides adding more salt? Led display says HOT all the time. Its new cell T-15 .Checked cell looks clean inside. Called tech support said the main PCB needs replacement . I am confused if its the sensor or the PCB. I don’t want to change both.Even the PCB is new bought bought in February 2018. from amazon ware house. What does the temp reading on your control panel say? If your water temperature reads 215 degrees F, the cell temperature sensor is shorted and your cell needs replacing.